September | 2013 | Arthur in the Garden. Staycation: Day One- The Reckoning. 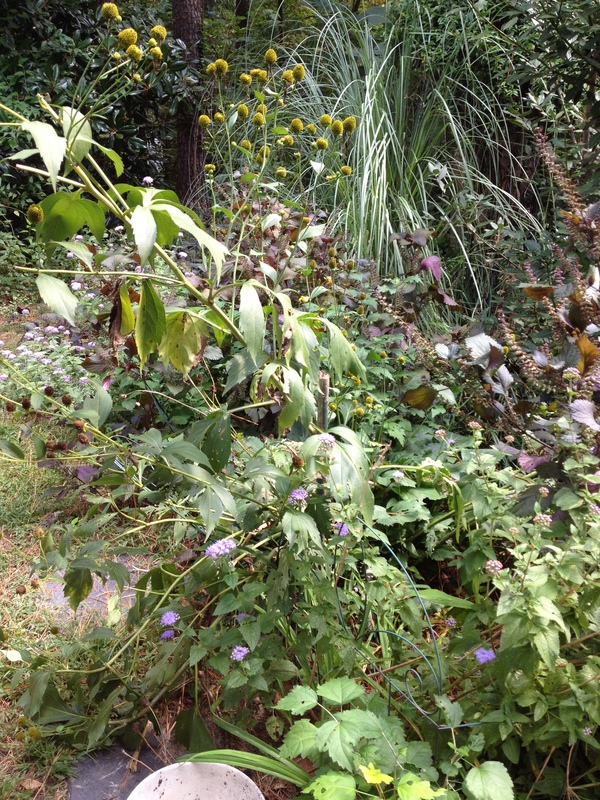 Today, I pruned and cleaned old growth on many of the larger perennials. 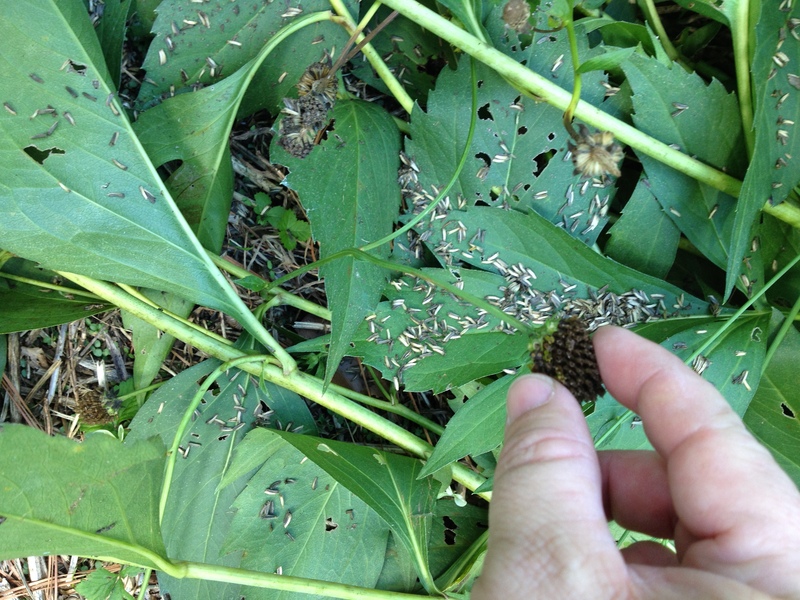 The annual black-eye Susans (rudbeckia) and the flower stalks on the Prairie coneflowers (Ratibida pinnata) are in the process of dying and dropping seeds. I speed this process along by pinching the seed heads and sprinkling the seeds in the beds for next year. If they are not eaten by songbirds this Fall and Winter they will germinate and bloom next Summer. Below you see as I pinch the dry seed heads the seeds fall on the leaves and ground below. The old 5-foot bloom stalks with the seed heads of the Rudbeckia “Autumn Sun” are removed leaving the rosette of leaves which are evergreen throughout the Winter. 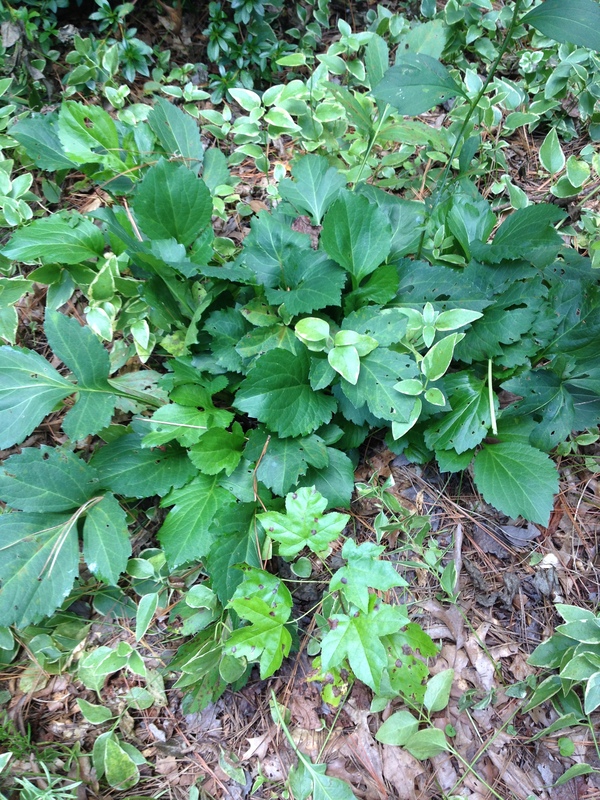 The evergreen leaves form a mound about a foot high and 18 inches across. 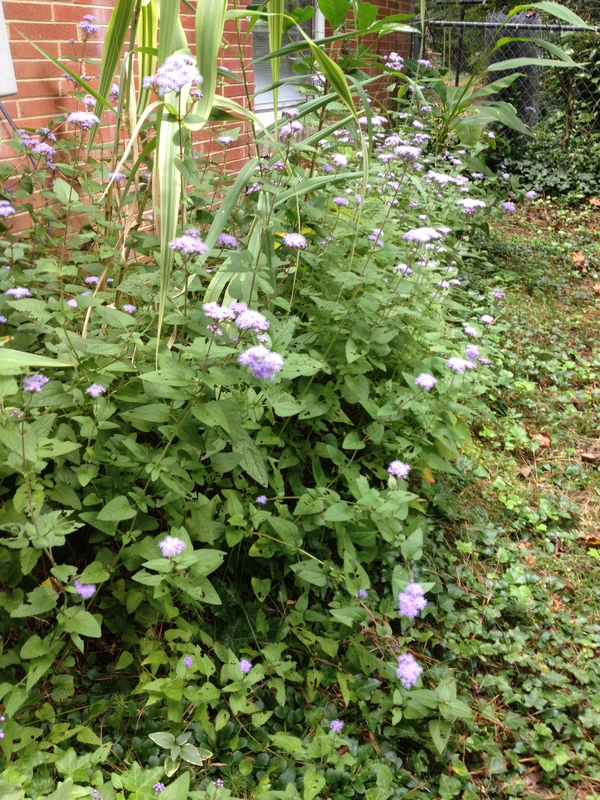 On the South side of the house is one of my favorite Fall blooming native perennials. Blue Mist Flower (Eupatorium coelestinum) forms large colonies and usually requires moist soil but on the South side of the house they are in direct sun all Summer and they never receive supplemental water because the hoses are difficult to drag over there. Still they form a thick colony about two feet tall along the entire foundation. It is also know as perennial ageratum and is a common pass along plant. 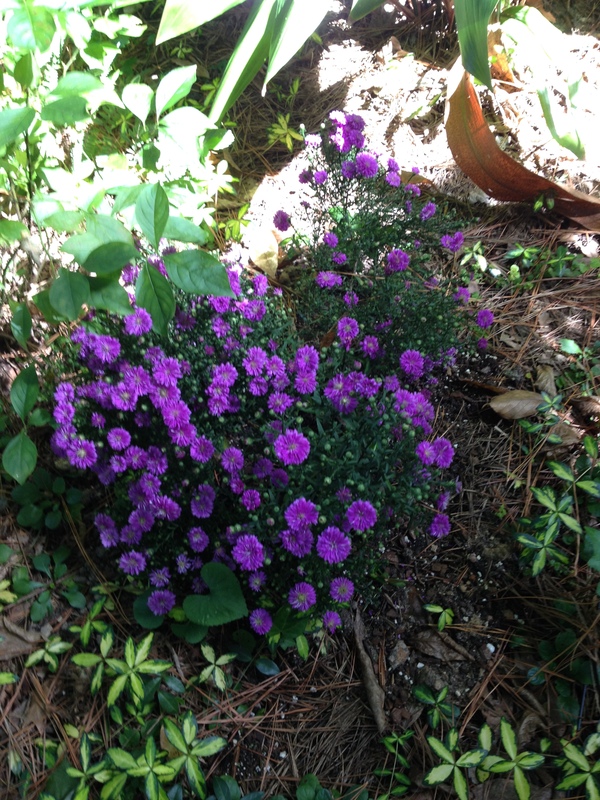 I think the origin of my plants are my grandmother’s garden in Beaufort in the 1970s. 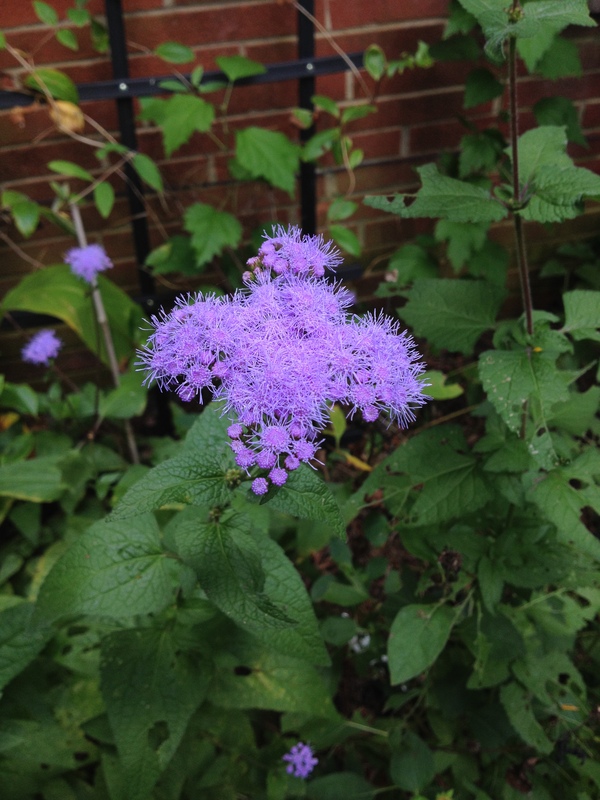 It produces a beautiful purple flower which resembles an ageratum. Asters are in season, too! 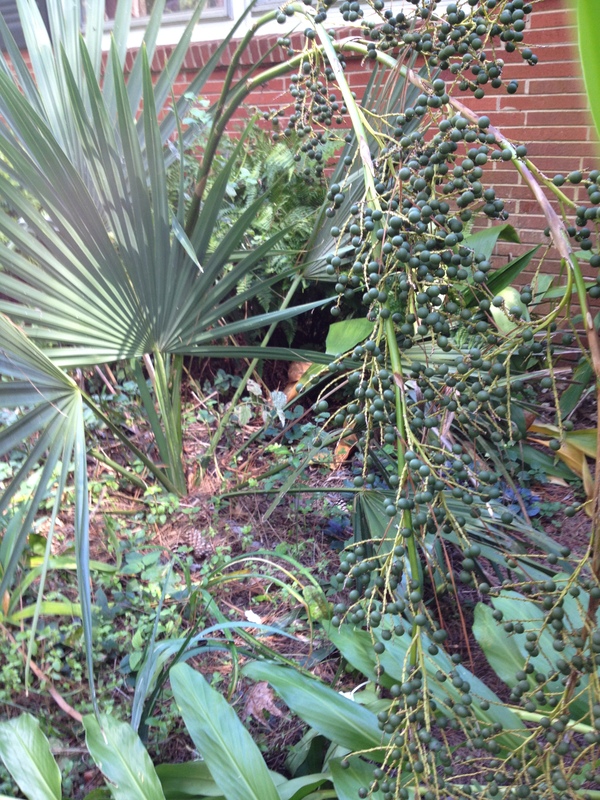 The Dwarf Palmettos are loaded with fruit. The birds love these, too. I have several groups of these trunk less palms around they yard and I have noticed volunteers here and there. I try to pick the fruit as they ripen and toss them into areas where I would welcome their tropical appearance. 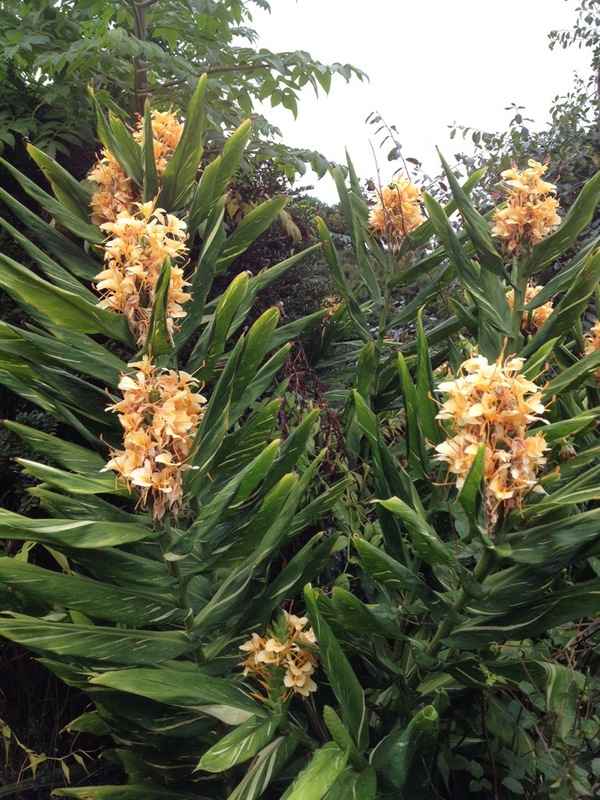 The leaves can reach about 3 or 4 feet wide and just as tall so they require a large space. Luckily, they grow slow. These are over 10 years old and are about 5 feet in height. 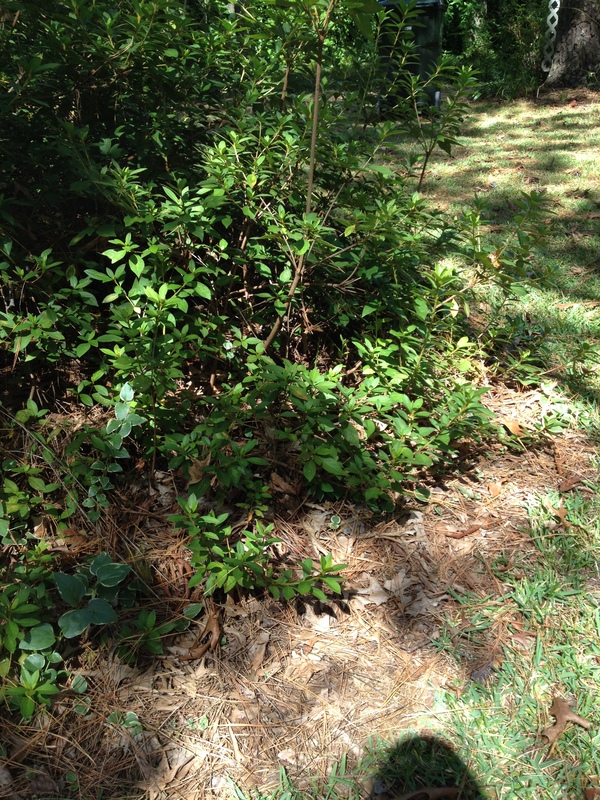 The last bed I tackled today was the ring around the oak tree in the front yard which has several Formosa Azaleas. Every year I rake the fallen oak leaves back around the oak and the azaleas. This buries some of lower limbs under the leaves. 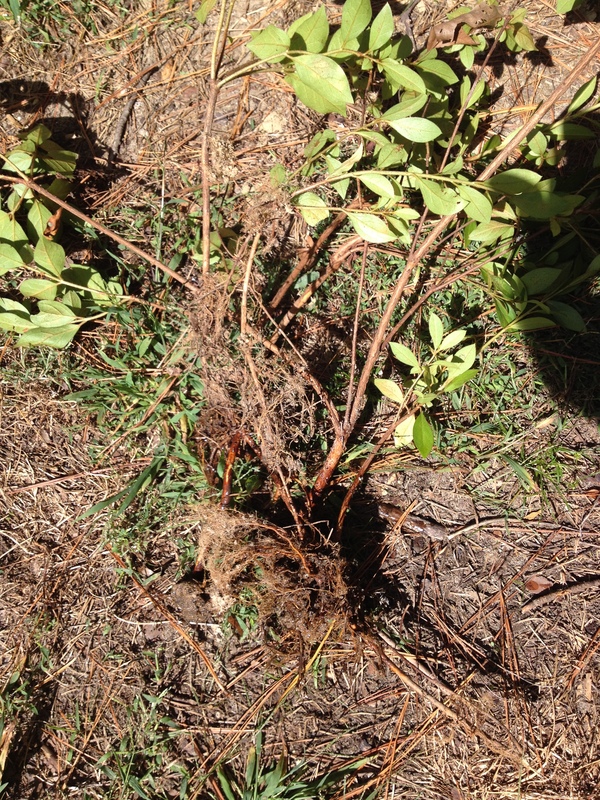 They eventually root and form new plants. I separated these from the mother plants and will use them to fill empty pockets in this bed and maybe plant a few around the yard. This is my favorite Indica type azalea. 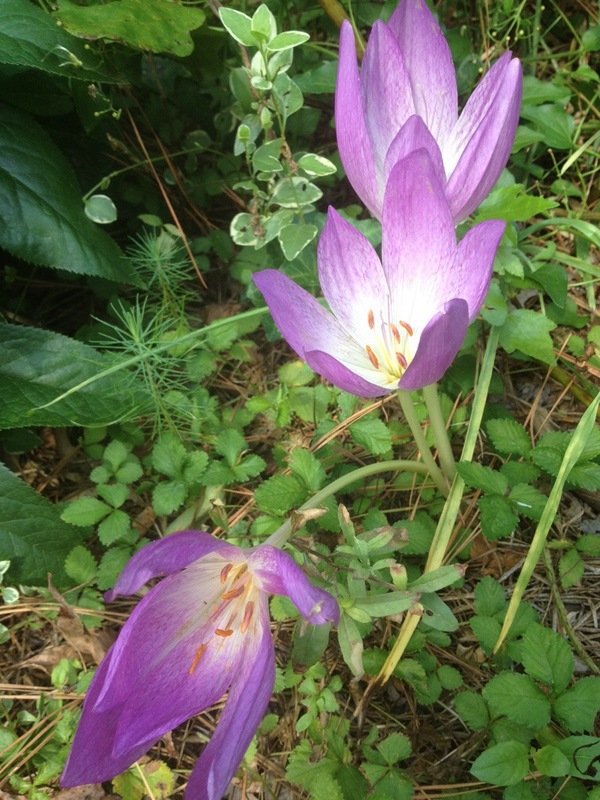 They grow very large, 8 to 10 feet, and have large purple or magenta flowers. They are cold sensitive and will not grow much father North. And now I am tired but there is still more to do on day two…. Fall continues to roll in. Fall continues to roll in. The nights have cooled to the 60s and the days are barely in the 80s now. It’s hurricane season. We have not had one come this far inland in years but it has happened before. It’s not always a bad thing. They clean out all the dead limbs in the trees and wash out the rivers of all the debris that has accumulated over the years. The last storm that made it inland punctured the roof of the house with a large limb. I always wonder: Will this be the year? 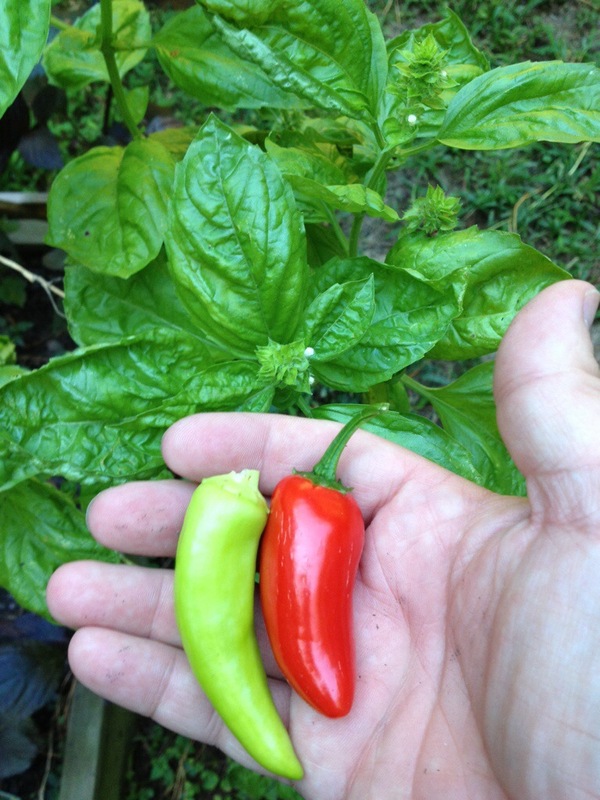 The vegetable garden has produced its last few chilies and the tomatoes have long died. The basil plants are so large they are like small shrubs. I think I may be attempting to make pesto soon? Winter is the time when I focus on the hardscape in the garden and attempt to correct any ideas about the layout of the beds that seemed to not work over the season. Throughout the year I take pictures of ideas in public gardens or around town as reminders of elements I would like to have in my garden. 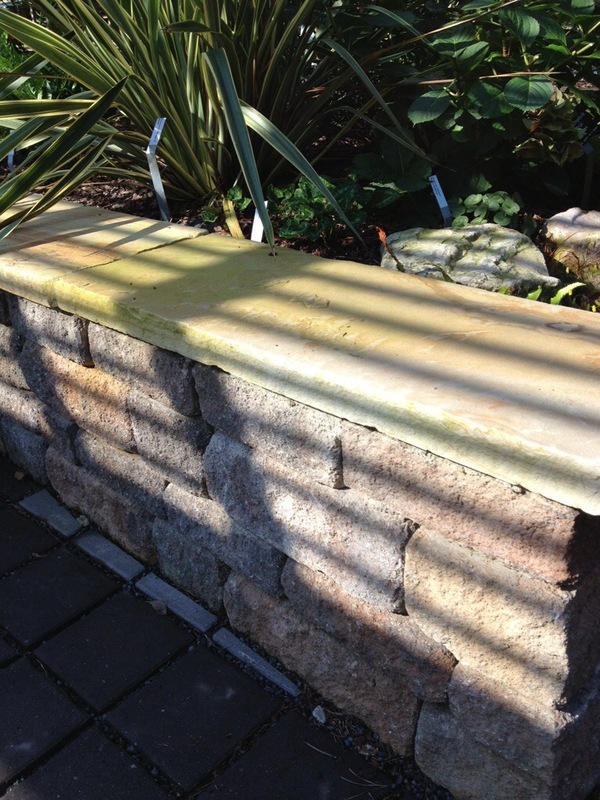 I particularly like this stone wall and capstone JC Raulston Arboretum installed in their lathe house. I would like something similar on the North side of the patio as that is the high end of my sloping property. It would provide a place to sit or display potted plants and also frame the bay laurels I have planted there. The cap stones are beautiful. 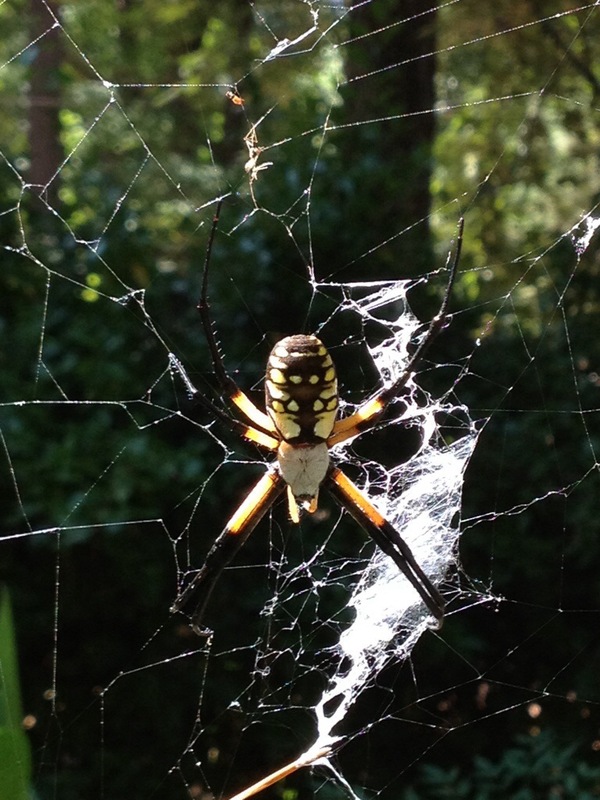 Garden spiders continue to appear out of nowhere! Beautiful yet creepy! And Fall bloomers continue to create a beautiful palate of color and fragrance. I dream of gingers… the clump below are a peach-colored and variegated leaved plant at J C Raulston Arboretum at North Carolina State University. I Love risotto. It is simple to make – for me, and I do not understand why chefs try to make it seem so difficult or out of reach. 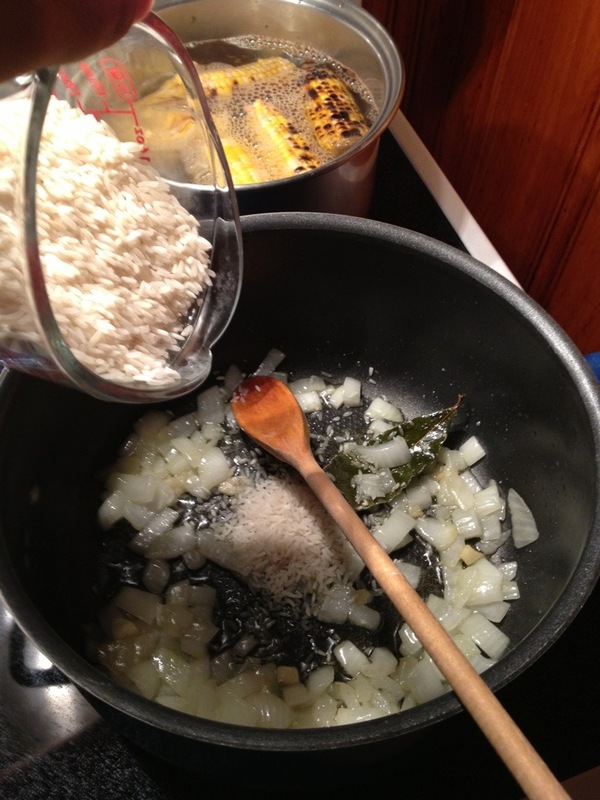 I use regular long grain rice and I have no problem with the rice releasing enough starch to make a creamy risotto. 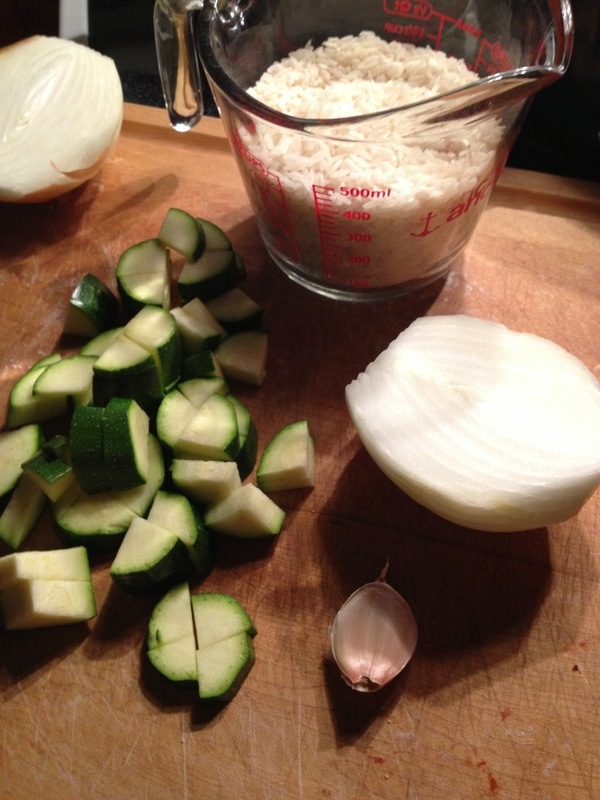 These are my easy steps to make a creamy risotto with zucchini. 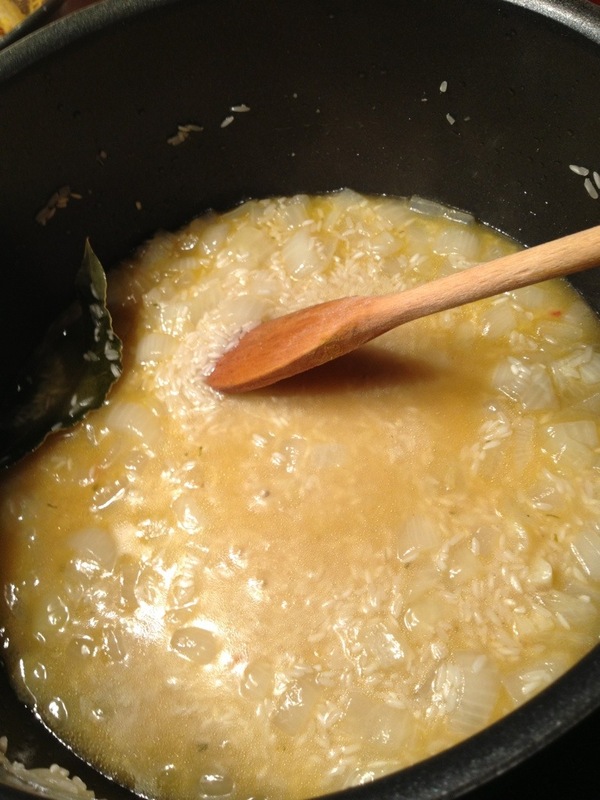 3.5 cups boiling broth – I used vegetable stock made from bouillon cubes. 1) Cover the bottom of the pan (I use a Dutch oven) in olive oil and place it on the stove on medium high heat. Add the onion and stir to coat with oil. Continue to move the onion around so it does not burn or stick to the pan. 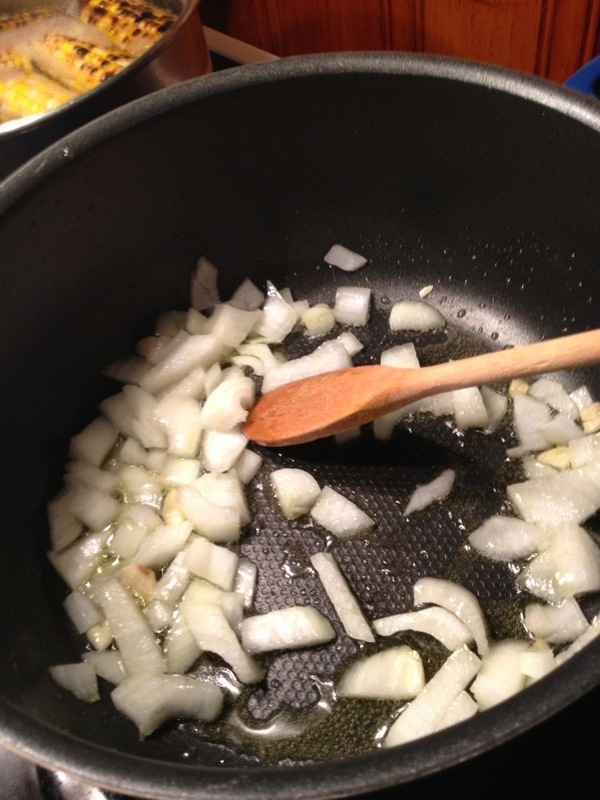 Once the onion is soft and translucent add the garlic and stir until well coated with oil. 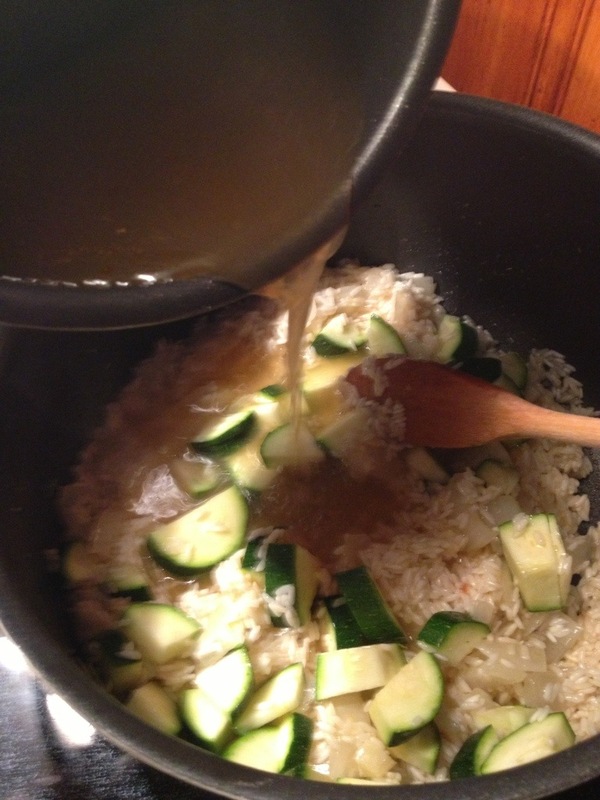 2) Add the rice and stir to coat with oil. 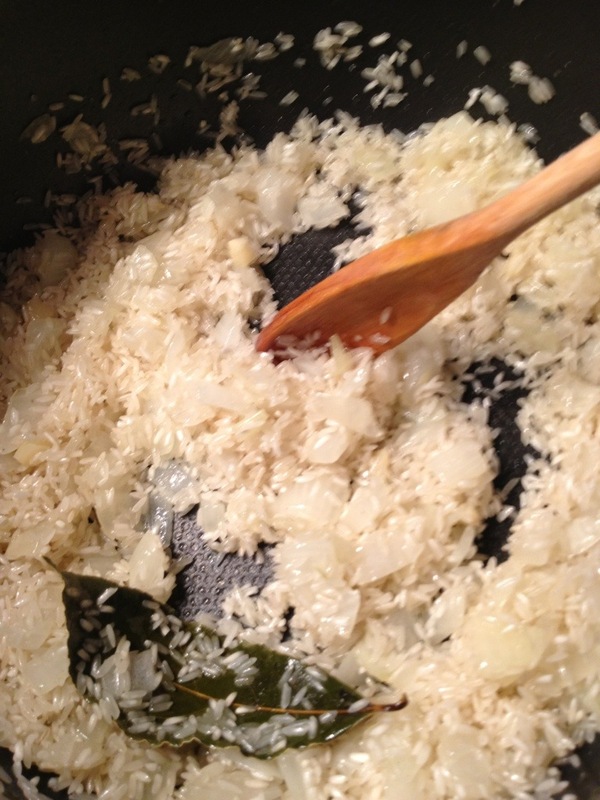 3) Continue stirring the rice to coat with the oil. I threw in a bay leaf for flavor. 4) When the rice has become translucent, turn the heat to medium and stir in half of the heated stock. 5) Continue to stir. 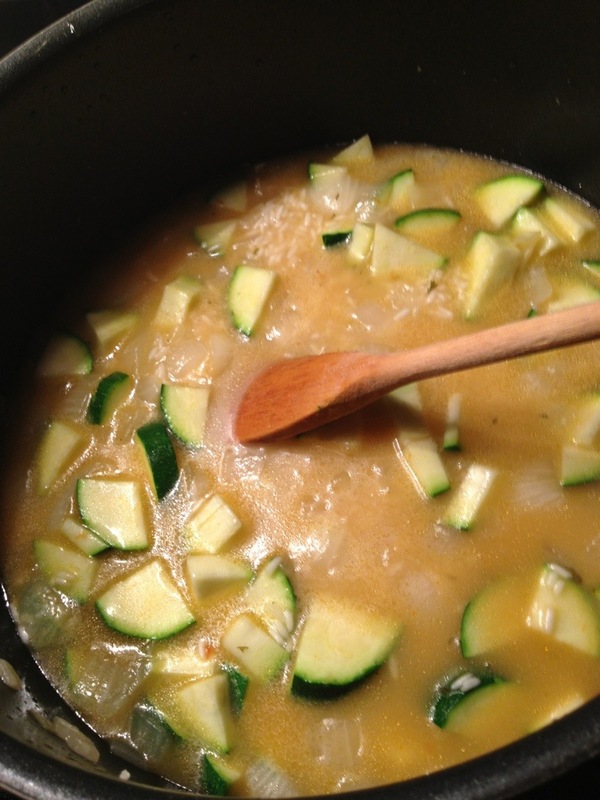 Once the stock has been adsorbed, add the squash, and the remainder of the stock. 6) Stir constantly until the stock is absorbed. 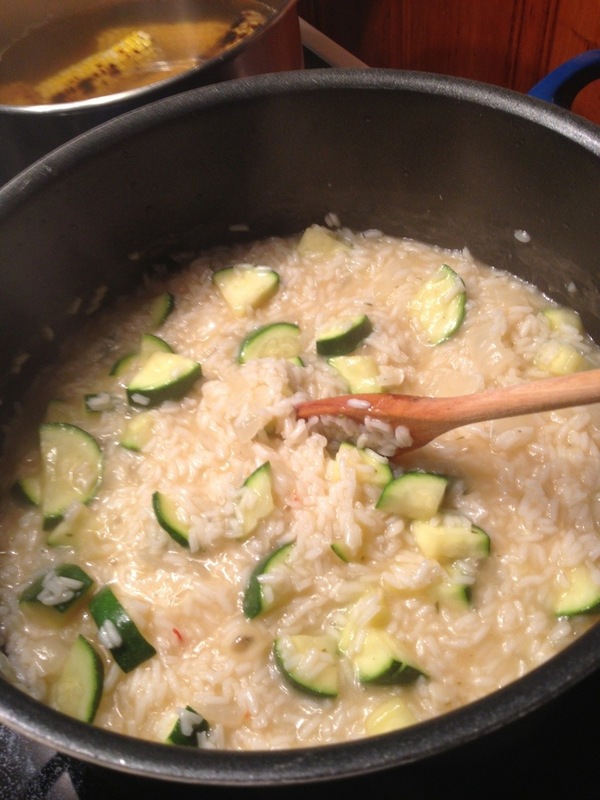 7) The rice should begin to thicken and the squash should have softened. 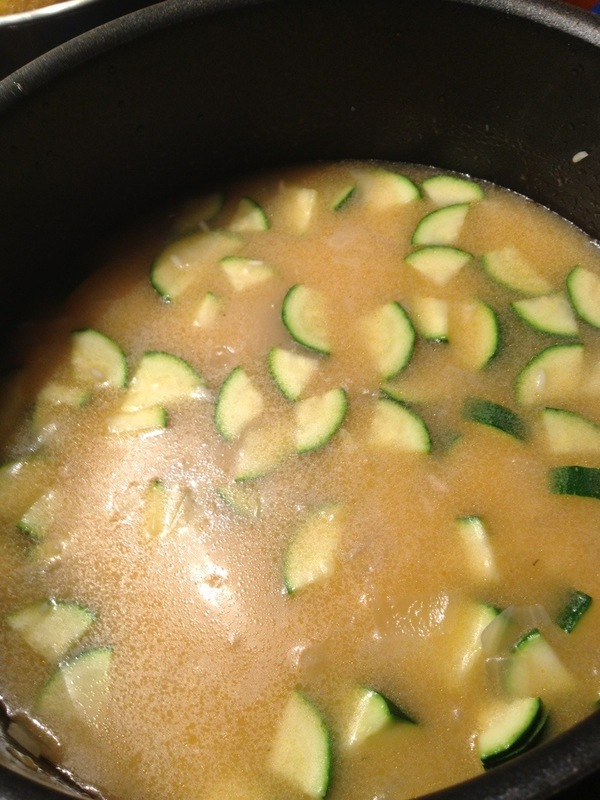 8) My last step, once the remainder of the stock has been absorbed and the squash is cooked, is to add 1 cup of hot water. Continue to stir. 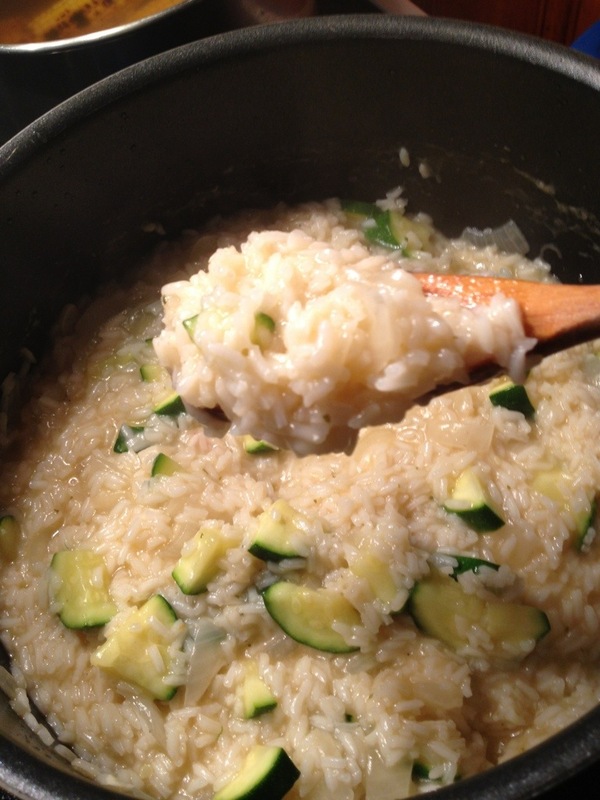 9) Once the water is absorbed the starch in the rice should have been released and created a creamy risotto. Salt and pepper to taste. 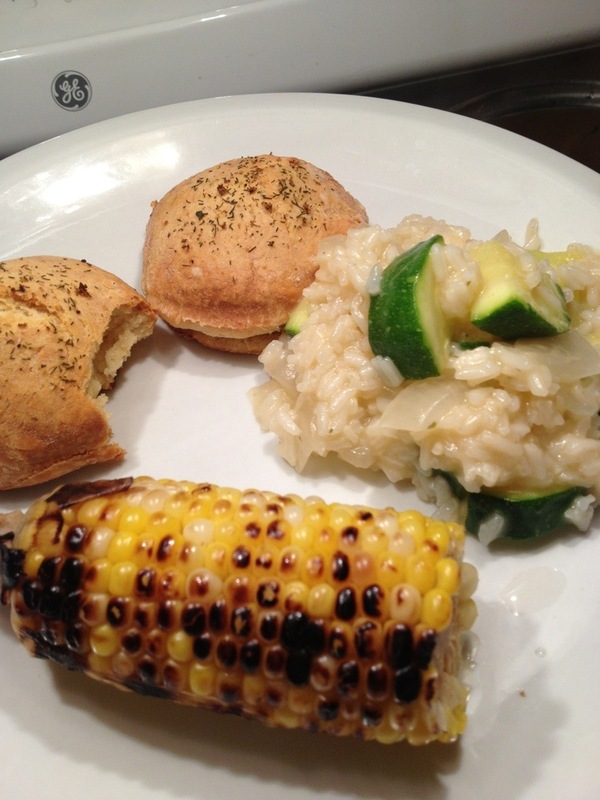 And with grilled corn and homemade buttermilk biscuits…its dinner! You can add any vegetables you wish. Broccoli would be nice, as well as, cauliflower, too!